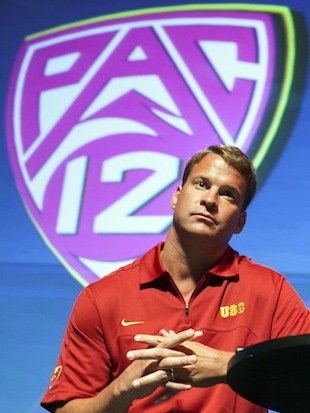 UNIVERSAL CITY, Calif. - Lane Kiffin has no intention of letting the left hand know what the right hand is doing. During Pac-12 media day Tuesday, Kiffin, the head coach at USC, spoke highly of Penn State coach Bill O'Brien and even offered advice to the first-year coach, who was just hit with unprecedented NCAA sanctions. "I think when you go through a situation, like everyone else we recruit high school players, but now you have to recruit your own players to stay and we were in a position where obviously our junior and seniors can leave and they're in the situation where anyone can leave," said Kiffin, who walked into a USC program that also was hit with scholarship losses and postseason bans. "And that's not an easy position, you have coaches flying players to their schools, during summer school. It's your backups, sometimes schools will say you can come and start here while you're a backup where you are, and it's not easy." It's definitely not easy when the coach trying to offer up the advice is the coach trying to poach your players. 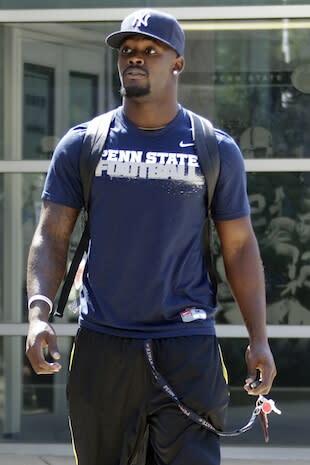 Kiffin is reportedly chasing after Penn State's top running back Silas Redd. And while, thanks to NCAA rules, Kiffin couldn't specifically speak to USC's interest in Redd, he made a point to mention how thin the Trojans were at running back this upcoming season, including talking about putting highly touted freshman receiver Nelson Agholor in the backfield to add depth. "Our plan up to today has been to put Nelson at running back because of the issues there," Kiffin said. "Outside of Curtis [McNeal], really, D.J. [Morgan] has played a little bit, nobody has played so as of today that's the direction he's headed." Notice the "as of today" caveat in that sentence. Redd hit the free-agent market Monday after the NCAA handed down multiple sanctions and told current Penn State players they could transfer without penalty and play immediately. Since then, coaches all over the country have been circling the Nittany Lions' roster like vultures. Silas Redd Sr. told the Harrisburg Patriot-News via text message that his son was "Still sifting through it all!" The addition of Redd would make the Trojans an even stronger contender for a national championship. Redd rushed for 1,241 yards and seven touchdowns as a sophomore and would have two years of eligibility if he decided to transfer. As for Penn State, it's going to have a tough time keeping players and recruiting players with just 65 scholarships and a postseason ban until 2016. If Redd leaves, it could create a domino effect that could decimate the Penn State roster and leave the team crippled for some time.